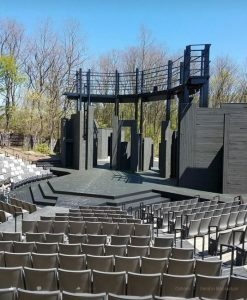 Westbrook (WAE) was the structural engineer for the new outdoor stage referred to as “Up the Hill” at American Players Theatre (APT) in Spring Green, WI. The existing stage was removed in its entirety and designed new from the ground up. The stage now has a full 12-foot tall basement constructed of reinforced concrete. The structural framing is all structural steel with black locust siding. Due to the immense change of the structural steel framing, the stage doors are now bigger and two of the doors have pivot hinges cantilevered off the end of the walls. WAE also did the structural design for the new rehearsal rooms, clubhouse, rain and bus shelters. Westbrook was also involved with site civil tasks regarding the APT expansion and renovation project. WAE assisted APT in developing conceptual site layout location of the new items located behind the new renovations to the stage area, which included a building to be used for equipment and scenery storage and a new rehearsal building. The back stage area also included roadway realignment, walking paths, and utility locations (water main, storm sewer, sanitary sewer, sanitary lift station and force main, electrical and fiber optic lines). Conceptual site layout was developed as well as modifications to the patron areas of the lobby and shuttle bus access location. During the conceptual design and layout process, various options and alternatives were evaluated through collaboration with numerous members of this project’s design team (APT representatives, architect, stage design consultant, acoustic design consultant, building prime contractor, ect…). There was also coordination with WDNR regarding items associated with proposed grading, endangered species, SWPPP, driveway permit and sanitary district. Final plan and specifications were given that associated with site grading, erosion control, water main and sanitary sewer. Westbrook provided APT with updated engineer’s construction estimates for the various items associated with site civil activities of this project. The renovation of the Hill Theatre is complete and they invite you to celebrate at the Grand Opening July 2, 2017. Celebrate this next great stage of APT and dedicate the new theatre. Free and open to the public, no tickets required.